*Myself pictured with Daniel Choi on December 18, 2011. 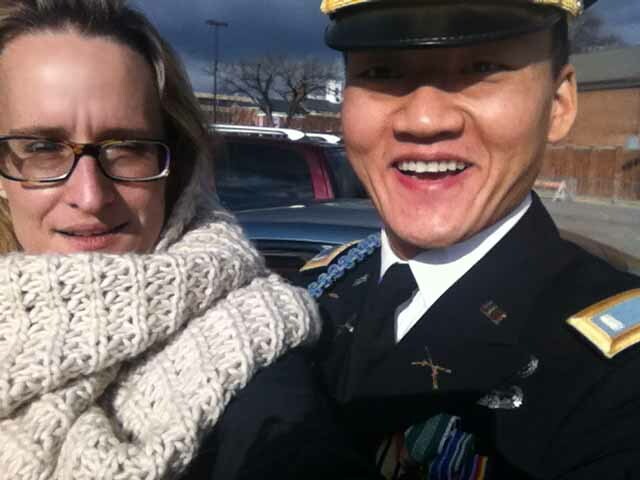 Choi was also in attendance at Fort Meade, MD. You can hear him describe the abuse he experienced at Fort Meade, MD on December 19, 2021 on democracynow.org. He was reportedly thrown to the ground, handcuffed, had his rank ripped off his unifom, and was forcibly ejected from the pretrial proceedings. I sat next to or near Daniel Choi in the courtroom on both Saturday afternoon and Sunday morning. I only saw Daniel Choi behaving in a respectful manner during the proceedings or while the court was at recess - both in the gallery or on the premises. The Federal Police Officers began watching the public in attendance more overtly - even hanging around to watch us outside the security perimeter of the courthouse - when Daniel Choi showed up on Saturday. Unlike Friday all day, and Saturday morning, when Daniel Choi was not in the public gallery, Bradley Manning exited with armed soldiers through the public gallery when recesses were called or at the end of the day. Starting Saturday afternoon - after Daniel Choi showed up - the public was told to leave the gallery before the guards would even move Bradley Manning, or Bradley Manning was exited through the back. In fact, after the morning's proceedings on December 18, 2011, I moved to a back row on the defense side of the gallery, and away from Daniel and the others who were talking at a recess. I did this in order to collect myself for the task of transcription. From my new position, I watched one unidentified, caucasian, middle-aged man in a dark suit wearing glasses with dark curly hair - stand and lean against the middle pew on the prosecution side of the gallery - 3 feet away from Daniel Choi and a little back. This man watched Choi - never once lifting his eyes for about five minutes - until he caught me looking at him watching Choi in a like manner to himself. He then looked over at one of the soldiers guarding the proceeding, who was dressed in a similar military uniform as Daniel. They both raised their eyebrows at each other. I had arrived at the Fort Meade, MD courthouse at 8:00 a.m. on December 18, 2011. The following 32 pages of typed transcript were taken by hand and may contain errors, misspellings of names, and or may be incomplete. The Investigation Officer is Paul Almanza, an Army Reserve Lieutenant Colonel and Justice Department prosecutor. Prosecution is Captain Ashden Fein, Captain Joe Morrow, and Captain Angel Overgaard. Defense is Mr. David Coombs, Major Matthew Kemkes, and Captain Paul Bouchard. Day began with prosecution and defense teams exiting the courtroom together - possibly to meet in chambers for an R.C.M. 802 conference. They exited together through the back. At one point, a member of the prosecution returned and told the gallery that it would be 5 more minutes. Defense (Coombs): What exactly does the government have? One. Does it exist? Two. Do they have authorization? If you deem it irrelevant, it does not stop at trial counsel. I would like that to go on record...and disclose the State Department, FBI, and DOJ. Fulton: Officer in Charge of Squadron Intelligence. Prosecution: What do you do? Prosecution: Are you an Intelligence Officer? Prosecution: That what you do? Fulton: Officer's basic courses...then military Intel courses. Prosecution: What was your previous position? Fulton: Assistant Officer in charge as Lt. Platoon Leader....Brigade Officer in charge...Brigade Assistant S2. Prosecution: How many times have you been deployed? Fulton: Two times. Afghanistan from 2007 to 2008, and Iraq from 2009 to 2010. I arrived in Iraq in 2009, was deployed in October. Prosecution: Why did you arrive so close? Prosecution: What were your duties? Fulton: S2...Intel Security for deployment operations order...instruction ordered to get in country...lay down of threat for the environment. Prosecution: When did you first meet PFC Manning? Prosecution: How did you meet him? Prosecution: What do you mean? Fulton: According to the person who directed me to him, he [Manning] had a better understanding than the others. Prosecution: In your experience was that true? Prosecution: What were his duties? Prosecution: How does one become an "all source"? Prosecution: What are the requirements for TOP SECRET clearance...? Prosecution: Why do 35 Foxes have TOP SECRET clearance? Fulton: Because in order to...they have to be able to pull information from different class levels. Prosecution: Are you familiar with their training? Prosecution: What is operational training? Fulton: How basic things you may do can compromise security. For example, if you post a picture of yourself on base on FaceBook, although your intent might not be to compromise security, the enemy can use the information against U.S. forces. Prosecution: 35 Foxes learn that? Defense (Coombs): Have you ever been an instructor of 35 Foxes? Fulton: No. But, I have assisted in their training. I.O. to Prosecution: Do you have any additional questions to lay foundation? Prosecution: How many new junior enlisted soldiers? Fulton: At least seven currently...and I don't know who else arrived. Prosecution: Out of those ten, any receive AIT at your unit? Prosecution: Did they receive other training? Prosecution: So any training they would receive from AIT [Advanced Individual Training]? Fulton: Basically means information...both classified and non classified management. Prosecution: Can you be more specific? Fulton: How to collect, mark, and destroy. Prosecution: What do you mean by 'marked'? Fulton: TOP SECRET is top secret...SECRET has certain caveats...UNCLASSIFIED...CONFIDENTIAL. Prosecution: Can you give me an example? Fulton: UNCLASSIFIED has a green mark top and bottom...SECRET...top and bottom. Prosecution: How about in a digital system? Prosecution: As part of InfoSec training, what is presumption...? Prosecution: So as part of training what is taught about what a soldier is to presume? Fulton: Because if it's marked CLASSIFIED, it is CLASSIFIED. Prosecution: Is it the job of the analyst to determine classification? Fulton: No. If it is marked CLASSIFIED, assume it is CLASSIFIED. Fulton: [She pauses. Throughout the prosecutions questioning of her, she takes very long pauses to answer her questions. Like she has to search for answers.] Because that is done by someone in authority. Prosecution: Anyone in your group? Prosecution: Has to be appointed by the Secretary of the Army. Is that so? Fulton: There is an ability to chat with other analysts...pulls database...provides map like diagram...personality based. Prosecution: What does it pull from? Fulton: CIDNE [Combined Information Data Network Exchange . That has become the database everyone uses. Fulton: Military and other defense agencies. Prosecution: Is CIDNE just an Intel platform? Fulton: I don't really think so. That is all I use it for. Prosecution: Human Intel, Tack raps [Signal Intel reports], Significant Activity [SigActs] reports...Those reports have classification marks? Prosecution: How would you know that documents are classified? Prosecution: When you pull...is it in a database...? Prosecution: Is there a classification field? Prosecution: What sort of fields exist? Fulton: When military are kidnapped. Prosecution: Sources of Intel provided to members of Army in Iraq? Fulton: There could be...[She then asks...] Are you talking about CIDNE or Significant Activity? Prosecution: Is there a difference? Prosecution: So positions of U.S. forces is contained in the data...? Prosecution: Does the CIDNE database contain information of the coordinates of US forces? Prosecution: Between 2009 and 2010 how U.S. forces reacted to I.E.D. attacks? Defense: CIDNE database has a lot of info...SigActs are a small part? Fulton: I would say small. Defense: SigActs won't have source names? Fulton: Depends on how it is written. Defense: So the SigActs that my client is charged with...whole bunch...not other stuff? Defense: Maybe prosecution can state what documents are, all SigActs. Prosecution: So we are talking about different types of information...December 2009 to January 2010...different indirect fire methods, techniques, tactics, and procedures...? Prosecution: Different techniques for I.E.D. attacks? Prosecution: Different techniques for rescue? Prosecution: When we stated...talk about the system? What is Intelink? Fulton: It is a system. Prosecution: Where do you find it? Prosecution: How is it used? Fulton: Where you would try to find information...not readily available. Prosecution: What type of information would come back? Prosecution: Was that undertaken by 35 Foxes on a daily basis? Prosecution: When you arrived in Iraq what were your duties? Fulton: Doing all analysis of future threat. Fulton: When creating a future operations order...in order to help the commander, you need you need to understand what they are going to do first. Prosecution: What kinds of things do you want to know? Fulton: Everything you can know about the enemy. Prosecution: Did 35 Foxes help? Prosecution: Who relied on these products? Prosecution: Can you give an example? How would you give a question and get an answer from a 35 Fox? Fulton: If we had a fire threat...use D6 to search all indirect fire threats to lay info of in operational environment...then take all human reporting...pull HUMINT [Human Intelligence] and the enemy threat network: Which routes? How they travel? Where they store munitions? And then would direct assets on the ground for collection of Intelligence...to disruption zones...enemy locations or prevent attacks. Fulton: Enemy intends to disrupt but not to defeat. Fulton: Taking information and overlaying it on top of each other. Prosecution: Sit temp [I am not certain if this is the correct spelling of a word or if the word is slang]? Fulton: Situational locations of the enemy. Fulton: Where they store munitions. Prosecution: How would 35 Foxes get the information? Fulton: ...pull from CIDNE...most came from CIDNE. Prosecution: Would a person not familiar with the system be able to pull information? Fulton: Because it has to be filtered. For example. Query-Tree uses bullion logic...combination of words...otherwise superfluous...same with CIDNE, needs to be filtered. Prosecution: If you relied on "all source" they would have to pull it through...? Prosecution: When did you become an Intel officer? Fulton: To provide best threat product to commander. Our focus was election security. Prosecution: Main focus March 2010 F.O.B. Hammer? Prosecution: Where was your office? Fulton: Specialized Compartmentalized Information [She pauses.] I do not know. Prosecution: What does it stand for? Prosecution: Did Manning work in the S.C.I.F.? Prosecution: Your office was in the S.C.I.F.? Fulton: Yes...Back room was [indecipherable] Signals. Fulton: Unclassified. SIPRnet up to SECRET. Prosecution: Did any "all source" analysts have access to higher access? Prosecution: Highest level you could access was SECRET? Prosecution: Requirement to burn C.D.s? Fulton: The reason for the ability to burn C.D. 's was to share information with Iraqis. It was part of the mission. Prosecution: Allowed for any other means? Prosecution: While deployed with Second Brigade... [indecipherable maybe "description] ...of general security? Fulton: Don't release info to family. Don't go on FaceBook. Prosecution: Were computers on shared network accessed by "all Source"? Prosecution: What were rules of pulling information off network? Fulton: There weren't any restrictions because it was a shared network. It was easier to move information back and forth. Prosecution: Rules for pulling information off? Fulton: No way you would pull off information that wasn't pertinent. Prosecution: What makes it appear classified? Prosecution: How was authorization for the 2nd Brigade tech...maintain [indecipherable]? Prosecution: Pull to a personal computer? Fulton: ...because that is unauthorized disclosure. Prosecution: Is that something 35 Foxes would know? Fulton: At minimum they signed SF312 a Non Disclosure Agreement. They also have been trained. Prosecution: Is that supervised one hundred percent of the time? Fulton: Because of limited amount of supervision. Prosecution: What do you rely on? Fulton: That they have understanding of their job and take pride in their work. Prosecution: What were Manning's strengths? Fulton: He was very good at compiling data. Fulton: I had him work with D6...laying Human Intel onto a map...He could import and export Excel spreadsheets... So looking at number of spreadsheets...easier to use excel than input one at a time. Prosecution: Would he have to have an understanding of the data? Prosecution: Based on that, was there a reason for him to be investigating G.T.M.O. S.O.P.'s? Fulton: No. Not regarding Iraq. Prosecution: A reason for him to be searching for Iceland? Prosecution: For Julian Assange on SIPRnet? Prosecution: S.J.A. [Staff Judge Advocate] Web site? Prosecution: Pulling all the data from the CIDNE-Afghanistan database? Prosecution: Were you aware of the 2007 Apache video? Fulton: [Specialist] Schulman [Jihrleah] Showman was playing on personal computer before April 1 . Fulton: Her work station comp. Prosecution: She had it on SIPRnet system? Prosecution: So a classified system? Prosecution: When did you become aware? Fulton: Not sure. It wasn't exactly... didn't really know until Manning was arrested. Prosecution: Did you ever have a conversation about the video? Prosecution: Did you have non-verbal conversation about the video? Fulton: He sent email with two video clips, one of the Apache video, both side by side. Prosecution: Was the video released through the Internet the one on your shared drive? Fulton: That was the indication. Not sure. Prosecution: Email is on SIPRnet? Prosecution: Captain Fulton, were you aware of an Army investigation related to that video? Defense (Coombs): Your duty was Assistant S2? Defense (Coombs): Deploy as S2 Plans Officer? Defense (Coombs): You worked out of the SCIF on operation orders for election security? Defense (Coombs): Election security...helping the commander make decisions? Defense (Coombs): Mission was related to elections? Defense (Coombs): Product was important? Defense (Coombs): Election security was the main mission? Defense (Coombs): You were not in the chain of command...your relationship with Manning was merely counseling? Defense (Coombs): One soldier you relied on was Manning? Defense (Coombs): Manning was good for putting projects together? Defense (Coombs): Knew how to use excel, and could plot data points? Defense (Coombs): N.D.M.P. [Network Data Management Protocol] ...heavy Intel...you needed his assistance for steps? Defense (Coombs): ...lengthy and robust? Defense (Coombs): Asked him to create data-maps and slides? Defense (Coombs): He completed them in a timely manner? Defense (Coombs): Assigning him frequently? Defense (Coombs): Did a lot of work from November 2009 to 2010 that had to be completed in a timely manner? Defense (Coombs): You would go to him because he was good with computers? Defense (Coombs): Go to him because he was interested in the topics? Defense (Coombs): Sometimes he would find information for you based on discussions you had had? Defense (Coombs): Exciting to have someone like Manning? Defense (Coombs): Didn't believe he was a good analyst? Defense (Coombs): ...because they needed to grow? Defense (Coombs): Not like being an analyst is an easy thing? Defense (Coombs): He was still learning? Defense (Coombs): So because he was still learning, he was just tasked to get the data? Defense (Coombs): Then you would do analysis? Defense (Coombs): Your way of training was to ask questions? Defense (Coombs): Not surprising, you would even go through the data, even though he was not an analyst [Need verification. I think this is where he asked her if she would go through the data with Manning.]? Defense (Coombs): Person who was Staff Sergeant [I wrote phonetically "Ballard"] ...? Defense (Coombs): People in the S.C.I.F. listen to music? Defense (Coombs): Soldiers would pull the music from the shared drive and put on the D6? Defense (Coombs): That was common? Fulton: What do you mean? Defense (Coombs): Should they have had music on the shared drive? So no one ever told you music was a violation? Defense (Coombs): So they would pulled the music from the shared drive and put it on players, that ok? Defense (Coombs): If people watched movies they purchased from Iraqi nationals, pirated versions, was that ok? Defense (Coombs): There were games on the shared drive, soldiers played those games on the D6? Defense (Coombs): D6 machines used primarily for...? Defense (Coombs): mIRC chat as a baseline? Defense (Coombs): In fact, mIRC chat was installed on your machine as an executable desktop application? Defense (Coombs): And you needed it, because it helped you communicate. As you also believed Google Earth was part of the program (of tools)? Defense (Coombs): It was installed as a desktop application? Defense (Coombs): And you would use Google Earth? Defense (Coombs): Did you see Manning talk to [Master Sergeant] Adkins prior to the incident with [Specialist] Schulman [Jihrleah] Showman? Defense (Coombs): What did you see? Fulton: Manning was upset and sitting on the floor. Defense (Coombs): Arms around his knees, would it be correct to say he was curled up in a ball on the floor? Defense (Coombs): That is not common, is it? Defense (Coombs): Did you speak to -- to find out what was going on? Defense (Coombs): Were you present with the incident with [Specialist] Schulman [Jihrleah] Showman? Defense (Coombs): You had released [Specialist] Schulman [Jihrleah] Showman, but you brought her back? Defense (Coombs): You were looking for information, and no one could find it, Manning had tried to find it, and you needed the information? Defense (Coombs): So you had instructed someone go and wake [Specialist] Schulman [Jihrleah] Showman up? Defense (Coombs): And [Specialist] Schulman [Jihrleah] Showman was irritated? Defense (Coombs): You had your back to --- because you were on the phone --- and you heard [Specialist] Schulman [Jihrleah] Showman was irritated with Pfc. Manning? Defense (Coombs): And she was irritated because he was playing a game? Defense (Coombs): You knew Manning had already looked for the information? Defense (Coombs): You heard Manning say, "You need to calm down," to [Specialist] Schulman [Jihrleah] Showman...with [Specialist] Schulman [Jihrleah] Showman on the ground... [I did not write down the entire question, may have been two questions]? Defense (Coombs): She had said he had struck her, and she had a red mark on her face? Defense (Coombs): You told [Master Sergeant] Adkins that --- needed to be taken from him...needed to go to behavioral specialist because that was the standard response? Fulton: What do you mean? When you have an interaction like that between soldiers...I wanted him removed...especially in a deployed environment...you want to find out what is wrong. Defense (Coombs): Did you feel that a 'derog' was necessary? Defense (Coombs): Derog, his security clearance suspended, revoked? Defense (Coombs): Derog...call into question of whether they should have security clearance...some examples of reasons for derog are: Behavioral...lying to superiors...? Defense (Coombs): So obviously...derog process makes sure you track negative actions? Defense (Coombs): Soldiers and leaders have a responsibility to report behavioral issues with people who have security clearances? Defense (Coombs): So especially security persons had a responsibility for security clearance? Defense (Coombs): And, it was [Master Sergeant] Adkins duty to report...? Defense (Coombs): So if a soldier exhibited behavior that was untrustworthy or if a soldier exhibited mental problems...? Defense (Coombs): Where you aware of the Manning [Sergeant] Padgett incident? Defense (Coombs): Based on a conversation with [Master Sergeant] Adkins, what were your thoughts on the derog, you agreed? Defense (Coombs): How quickly can a persons access be pulled? Defense (Coombs): Once a soldier is 'derog'ed' do they have access? Prosecution: Captain Fulton, after Manning assaulted -- he was removed from the S.C.I.F. on May 7, 2010? Prosecution: Did he receive averse action? Prosecution: All soldiers, and especially 35 Foxes .... not to disclose? Defense: Your clearance is dependent on, ongoing behavior? Adkins: I invoke my Article 31 rights. I.O. : Are there any questions that you could be asked will not cause you to invoke Article 31 completely. Prosecution: We will not do this. I.O. : I find that this witness is unavailable. Balonek: On my behalf of my attorneys advice, I invoke my right to remain silent. I.O. : Are there any questions we could ask you that you would not invoke Article 31 rights? I.O. : Thank you Mr. Balonek. I find that this witness is not available. Prosecution: Are you in an area where you can speak freely? Prosecution: How do you know Pfc. Manning? Madaras: Met at Fort Drum...deployed to Iraq. Madaras: Sometime in 2008...in the smoking area. Madaras: 35 Fox Intel Analyst. Prosecution: Do you remember what you learned? Prosecution: What did you learn about the classification system? Madaras: Its importance...and the different classifications. Prosecution: What did you learn about classification? Madaras: Proper clearance and access. Prosecution: Learn about publishing information on the Internet? Madaras: Not that I recall. Prosecution: When did you arrive at 2-10 [2nd Brigade Combat Team, 10th Mountain Division] ? Prosecution: What did you learn...? Madaras: D6 class...August of 2008. Prosecution: What did you learn about the D6...? Madaras: ...like using a map...built stuff onto it to present to audience...? Prosecution: What did you do? Prosecution: Did you work with Manning [at Fort Drum. They were also on opposite shifts in Iraq.]? Madaras: He worked day, and I worked night. Prosecution: Did you deploy with him? Madaras: ...left in 2009. Pfc. Manning showed up a few weeks later. Prosecution: Where did you work? Madaras: Brigade S.C.I.F. F.O.B. Hammer. Prosecution: Where did Manning work? Prosecution: What was your job? Madaras: Same. I worked day, and he worked night. Then we switched. Prosecution: The two of you shared a work station...? Prosecution: Did you often use the Alienware? Madaras: Towards the end. Manning, he did. Before that the Dell. Prosecution: What was the mission of the Brigade? Prosecution: What did you do...? Prosecution: Did you share products with Manning? Madaras: Majority of the time, Manning did not complete projects. Prosecution: What programs did you use? Prosecution: So, you personally used Intelink? Prosecution: On those two computers, ever search for Iceland? [Prosecution goes on with a list...] Retention? Birgitta Jónsdóttir? CENTCOM? Reykjavik? WikiLeaks? Julian Assange? Prosecution: What would you search for? Madaras: Terrorists groups...um like Shia groups. Prosecution: Ever use Pfc. Manning's user profile? Prosecution: Did your computer ever operate out of the ordinary? Madaras: Yes. I would leave shift the computer would be working fine, come in and it would be crashing a lot. Consistently had problems, would have to get Mr. Allan Lomens Milliman to reimage. Defense (Coombs): We have spoken before on the telephone. You met Manning first in 2008? Defense (Coombs): In the smoking area? Defense (Coombs): You could tell he was interested in U.S. politics? Defense (Coombs): Both J.R.T.C. [Joint Readiness Training Center] in 2009? Defense (Coombs): Was Pfc. Manning in charge of fixing computers? Knew how to work on computers? Madaras: I don't know if he was "in charge" of computers. Defense (Coombs): At training did receive any training on not placing executable files on the desktop? Defense (Coombs): Worked as an Intel analyst...? Defense (Coombs): In this situation you worked day and Manning work nights? Defense (Coombs): You said many times Manning did not complete his work? Defense (Coombs): ...but you are not sure if he was tasked with other work? Madaras: Yes. That happened sometimes. Defense (Coombs): During deployment did you see any outburst from Manning...? Defense (Coombs): Did you see the event where Manning was asked to move a projector? Madaras: Was getting ready for the shift change. Know... [indecipherable] asked Manning to do it...tried to calm him down...took him outside. Defense (Coombs): Was he counseled in writing? Defense (Coombs): ...one or two occasions...put weapons in rack and then...anyone...is that appropriate conduct for soldiers? Defense (Coombs): Ever see Manning become non-responsive? Madaras: ... [Master Sergeant] Adkins called his name and he would just stare. Defense (Coombs): Unit members felt Pfc. Manning would do harm to himself? Defense (Coombs): Were you afraid that Pfc. Manning would do harm to himself? Madaras: I did not have that fear. There were some people who were worried. Defense (Coombs): Did Manning have any friends? Madaras: ...saw him talking to Sadler (sp.) Never saw him talking with others...maybe not directly. We would always see him running at night and say, "What is he doing...?" Defense (Coombs): The I.O. should not be allowed to ask questions as part of my discovery. My right is separate from what you determine as relevant. I.O. : I ask that you keep it to what he knows. Defense (Coombs): Was Manning an outcast? Madaras: I don't know if he was picked on...separated himself. Defense (Coombs): Listen to music on shared drive that was played on the D6? Defense (Coombs): Playing videogames on D6A? Madaras: Games that were already on the system. Defense (Coombs): You said your machine was always broken...if you have too much information on the desktop of your D6A machine it might crash, right? Defense (Coombs): When someone's machine was running slow, Manning would try to fix it? Madaras: Not that I know of. Defense (Coombs): Did D6A have mIRC chat? Madaras: He did have it installed. Defense (Coombs): You thought mIRC was mission critical - running as an executable? Madaras: If that is what it does, Sir. Defense (Coombs): You thought it allowed you to do your job? Madaras: Yes...communicate with other units. Defense (Coombs): So if someone wanted to add information to a D6 machine how would you go about doing that? Time did not permit me to stay due to a long drive back to New York City and work related responsibilities. I reluctantly left Fort Meade. MISSED CLOSED SESSION WHICH INCLUDED "RELEVANT GOVERNMENT AGENCIES"
This is the end of the transcriber's transcript of December 18, 2011 Article 32 Pretrial hearing of US v. Pfc. Bradley Manning, but it was not the end of the day. There was a closed session which allowed also "relevant Government agencies" and the first appearance of Special Agent David Shaver, Computer Crimes Investigative Unit [CCIU]. For those and all the other witnesses see Rainey Reitman's Detailed Notes and Kevin Gosztola's Live Blog.